Format, or sometimes called Post Format, allows setting a post as a certain format. 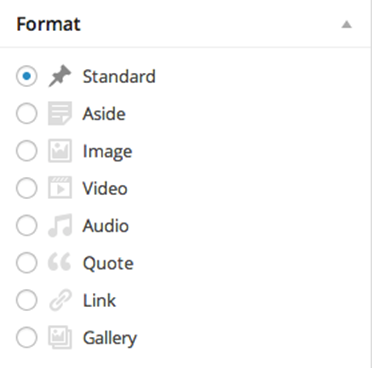 Some example formats are standards, aside, gallery, link, status, image and quote. This will allow themes to style these posts according to format. Setting a post format will change the way posts are being displayed into the site. For example if you set your post to have aside format, when you view the list of your posts on your actual website you will notice titles are gone. Once you set up your post to have a definite format option. You will notice its post format is indicated next to the title of your post. NB: You should consult your web developer or IT Department before using format.